We live in an oddly politically correct time. We are supposed to respect everybody's everything but not ever talk about it. Don't ask questions. Don't wonder. Don't talk about it. It shouldn't matter. Some of the discussions are newer, raw, fresh, others are re-circulated Huffington Post Articles telling me not to ever talk about my daughter's body. Each article captioned, in a post scrolling by on my feed, with "This." I think it's not so much THAT we talk about these topics as HOW we talk about these things. As a daughter with a body, myself, and especially as one who was naturally prone to never speak about anything having to do with my body, I am forever grateful that my mom encouraged me to talk, encouraged me to cry, to rejoice, helped me get help when I needed it. If she hadn't first encouraged me to talk, in the first place (even if I felt all...cringy...about it), I would never have told her that there was something very wrong when I was in college. I will speak to my daughter about her body. I promise to talk to you about your body. When you first arrived in the world, I wrote down some thoughts, and I realized I would have to do some work on myself in order to show you how to respect and treasure your body. Mimi started that process with me, and it's a long journey, one I hope will be less treacherous for you. Times have gotten even stranger, and I have found myself in the midst of those who say I should never talk to you about your body, compliment you on the splendor that is your magical, beautiful body. I promise you that I will not listen to them. I honor your body, and not only because I grew it inside my own, but because it is my responsibility as your mother to keep you healthy. If you gain or lose weight, I will comment. I will want to know why - is this because you are growing and changing? If your skin changes, if your hair is less shiny, if your skin is bruising...Is this because you are ill - emotionally, physically, or something in between. If you become a swimmer, a dancer, a gymnast, a runner, an athlete of any kind, I will speak of your grace, of your incredible strength. If you decide otherwise, I will admire whatever way you choose to release the power contained in your body. I will speak of your body so that you know never to feel shame for your height, weight, skin color, breasts, muscular legs, or any of the thousands of features people will judge. I will speak of your body so that you know that I respect that you walk in this world with me, that you are a mind and a body and a soul, that your body has such strength. I see it already, in way you place your foot, in the swing of your hips. You are fire. I see it in your flips, in the way you run, in the way you leap from my arms in the pool. You cannot help but move when you hear music. You bring the toys that make noise to us, begging for them to be turned on so that you can move, yet again, to the dancing flower singing, "I Want You Back." You turn, you twist, you change direction. You smile. You laugh. You find joy in having control of your body. And I admire it. I admire your comfort in your own skin, even at such a young age. I will speak of this as you get older. I will remind you of your freedom, should you forget it. I will help set you free if the world locks you down. I will tell you that your body is a beautiful creation, God's work, His temple, there for you to honor Him and also for you to enjoy. Work your magic on the world, darling girl. I will speak about your body. You deserve to hear that your body exists and deserves to be complimented, honored, praised. If someone treats you wrong, or if you want to talk about a change, an accomplishment, a concern, a triumph. I want you to know that you can talk to me, that your body is always a possibility in our conversations. 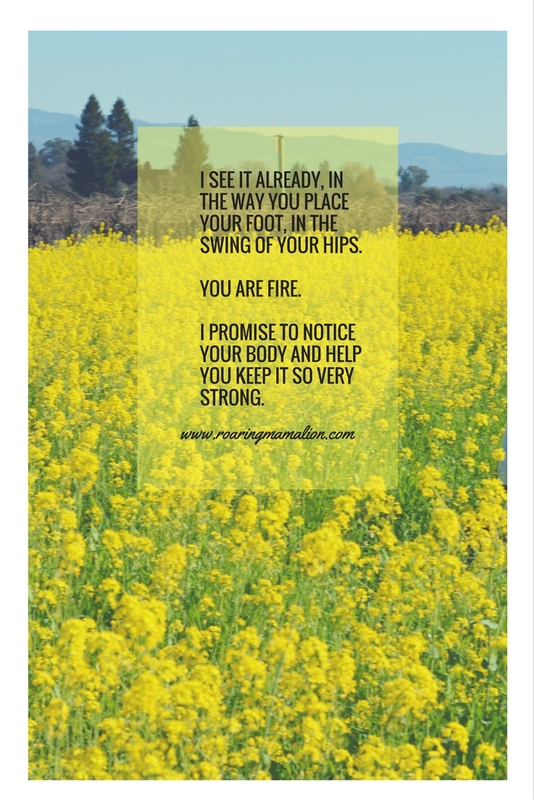 You are much more than your body, but your body is an extension, an expression of your spiritual, emotional, and physical health, and I promise to notice it and help you keep it so very strong. I love you beyond all measure.